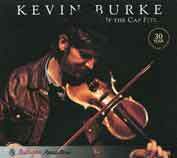 A fiddle player with an instantly recognizable sound,Kevin Burke is well-known today as a past member of the Bothy Band, a current member of Patrick Street, and a hard-working, often-recorded soloist. Although born in London and raised musically on a steady diet of the great Sligo players of the 78 era, Burke was also significantly influenced by the music of Co. Clare and that of Co. Kerry. This is quite obvious on this solo album, first released in 1978 while Burke was performing and recording with the Bothy Band during the great 1970s music revival in Ireland. The trademark easy flow of Burke's playing on reels is all Sligo, but the bluesy feel of the "Caislean na nOir" hornpipe track is very much Clare, and the great set of polkas concluding with "Bill Sullivan's" has that unmistakable Sliabh Luachra sound--not to mention the presence of Jackie Daly on some lovely duets, an introduction to Burke and Daly's later duet album "The Eavesdropper." This recording is also justly famous for the 11-tune, 16-minute set of reels which took a whole side of the original LP and is now the final track of the CD version. This is the 30th anniversary of the original release, and the CD has been remastered from the original analog tapes and includes new liner notes. The album is as essential to any collection of Irish music today as it was back in 1978.